Pour milk in saucepan, add butter, cocoa, sugar, broken chocolate. Boil over low heat, stirring, to get smooth mass. Remove from heat and cool. Sift flour and baking powder. Add together with yolks to cooled mass and stir. Put whites aside. Mix curd, yolks, sugar-powder, flour, vanilla sugar, starch and butter. Mix whites with whites from dough into steep foam. Divide mixed whites in half – carefully mix first half in chocolate, add rest in curd. Grease form 22х34 сm (I baked in cake mold) with margarine or butter and cover with baking paper. Spread half of chocolate mass. Put spoons of islands-hills of curd (in shape of flour – middle and petals around). Next pour top with rest of chocolate mass. Bake at 175-180 C for 60 min. Coll in slightly opened oven (because if you remove at once, curd cake will seize). 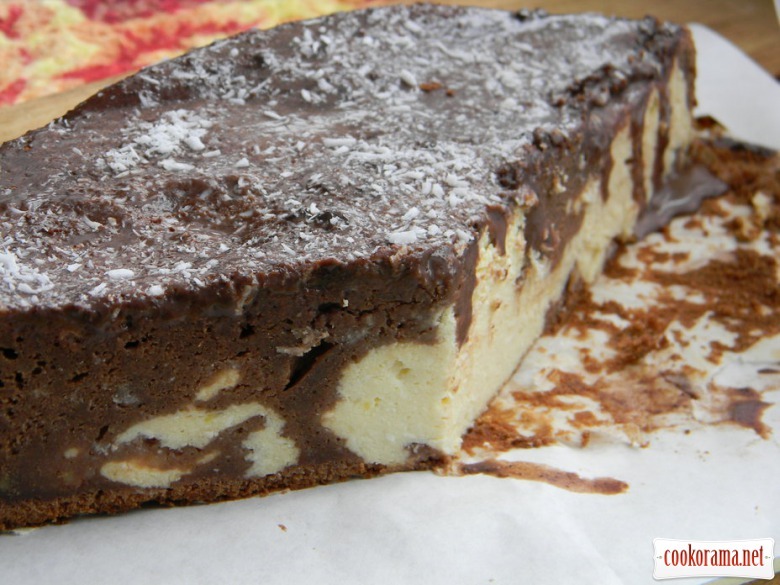 Top of recipe "Curd cake in chocolate dough"